Currently, many consumers turn to YouTube to learn how to do some kind of home improvement project. Now, Lowe’s is experimenting with technology to take that idea one step further. The home improvement retailer is aiming to educate DIYers on the ins and outs of projects they've never done before with the help of an on-demand virtual reality skills clinic. With Holoroom How To, consumers who aren’t feeling particularly confident in their ability to tackle a project on their own can see exactly how the project is done simply by strapping on a virtual reality headset. Navigating each step of the task in virtual reality first could potentially save users from making costly mistakes or messes in the real world. With a virtual reality headset on and controller in hand, users are immersed in a DIY experience. If, for instance, a user had never tiled a shower before, the simulation would walk the user through how to mix the mortar and lay the pattern. In addition to step-by-step instructions, the experience gives haptic feedback. Real world feelings, such as the vibration of a drill, can be felt through the controller. The company says preliminary studies have proven the multi-sensory VR training tool to be an effective means of increasing learning retention, boosting customer confidence, and enhancing motivation to take on DIY projects. This isn’t the first time Lowe’s has utilized AR and VR technology to walk consumers through problems pertaining to home design and improvement. 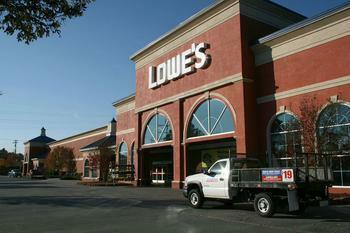 Lowe’s first utilized augmented reality to help customers solve design-related challenges in 2014. Back in November, the retailer launched Lowe’s Vision, an augmented reality app that lets customers see how different home furnishings, fixtures, and flooring would look in their home. "Our experience has shown that customers are embracing AR/VR as part of their home improvement journey, and now, we are using immersive VR to help our customers learn the required skills to complete challenging home improvement projects,” said Kyle Nel, executive director of Lowe's Innovation Labs, the company's disruptive innovation hub. Holoroom How To is set to make its debut at select stores in Boston and Canada. From there, Lowe’s will evaluate customer response to the pilot experience to see how this technology can be used to provide empowering training opportunities to both customers and employees.